Keep Calm and Love London. We weren’t really calm at all but actually quite excited. And loving London is easy. 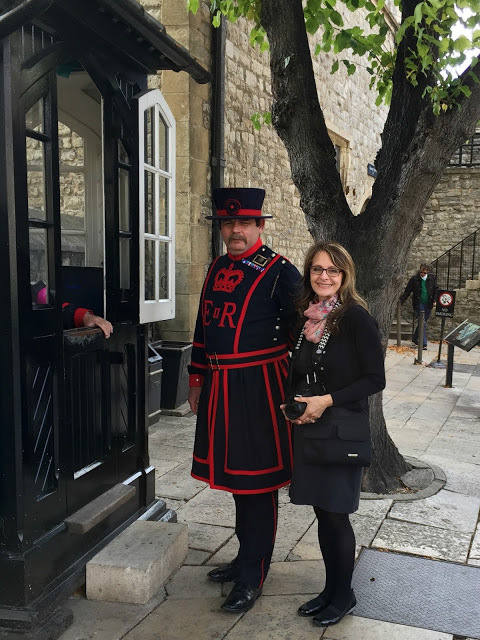 This was our second trip to this lovely city, across the pond and we were thrilled to be going to London, England again. This time with two of our adult children and our oldest grandson. 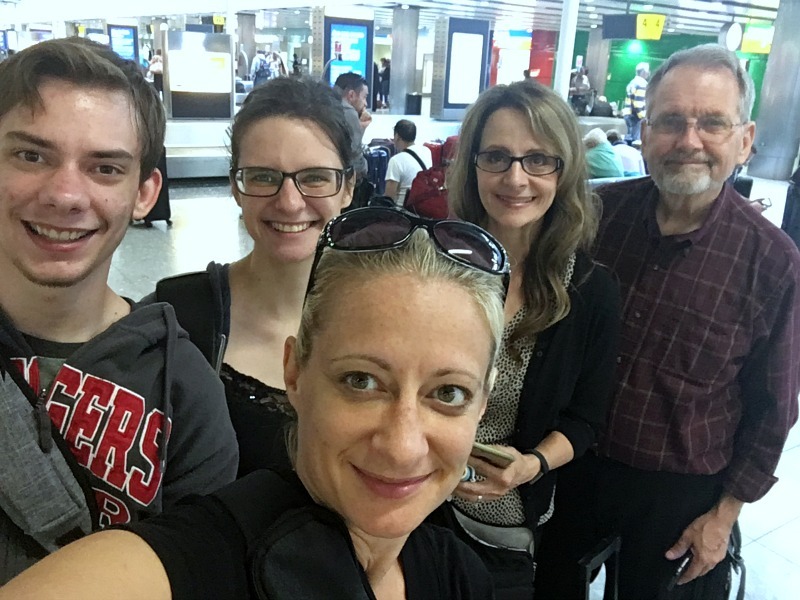 A little more confident in our international travel experience and our ability to navigate airport flights and customs as well as the tube and underground, took away much of our first-time anxiety. 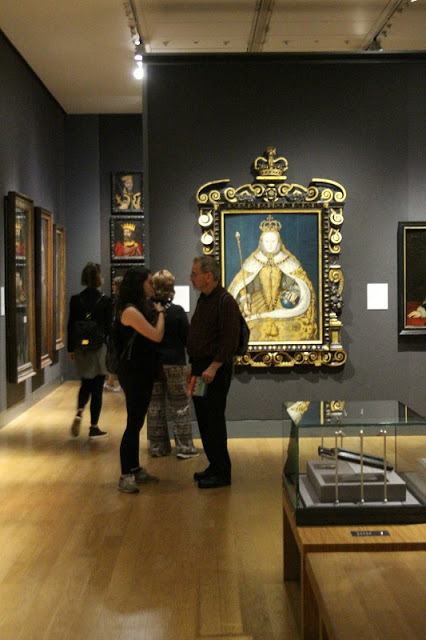 Once again we would be experiencing the history, art and culture that is so abundant at every corner we turned. Added to all of this, we would be enjoying it through the eyes of our kids. Our overnight flight to London was smooth even though we somehow got the very last row of seats in the plane making reclining impossible. The kids grumbled and contorted to try and glean a few hours of sleep before we hit the ground running during our first day there. I sat next to a most interesting man who, originally from Jamaica, has been living in London for the past 12 years. He is an editor and of course, engaging in conversation. We chatted while most sat quietly watching the monitor before them or dozed off, waking for the continual offerings of food and drink from the cabin service. Once through London Heathrow airport border check and baggage claim, we found our way to the tube for the hour-long ride to Kings Cross Station. On to our hotel to drop off luggage and then back on the tube to our first destination. 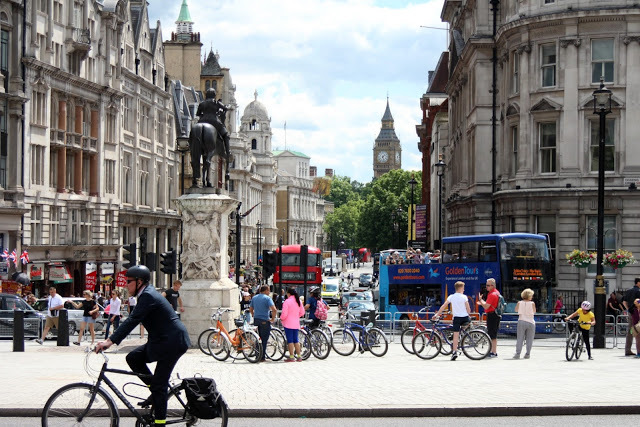 As we turned the corner from Charing Cross Road onto the square, we felt what all visitors must feel at that moment. People of all walks of life scurried past in determined fashion or simply relaxing on ledges, steps or monuments taking in the scene around them. The sky was blue with a few white, puffy clouds and cell phone camera’s captured the magnificent structures and smiling selfies on out-stretched arms. 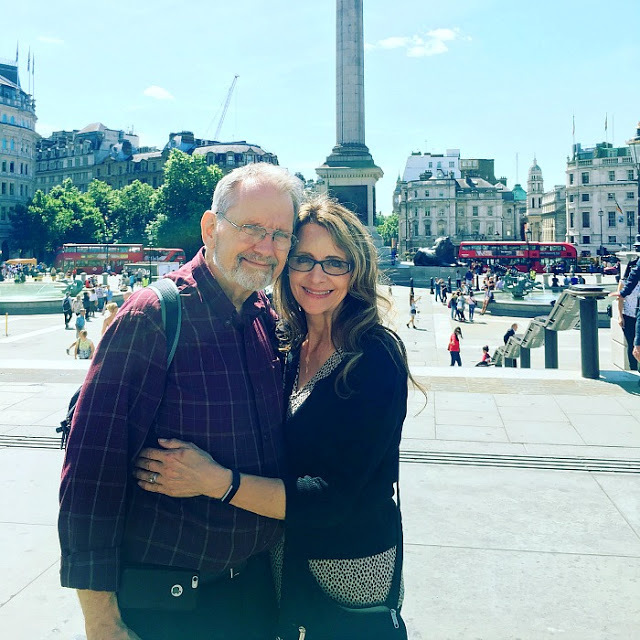 My sweetheart and I standing on the steps with Nelson’s Column behind us and the hustle and bustle all around us. Nelson’s Column is a monument in Trafalgar Square built to commemorate Admiral Horatio Nelson, who died at the Battle of Trafalgar in 1805. The monument was constructed between 1840 and 1843. 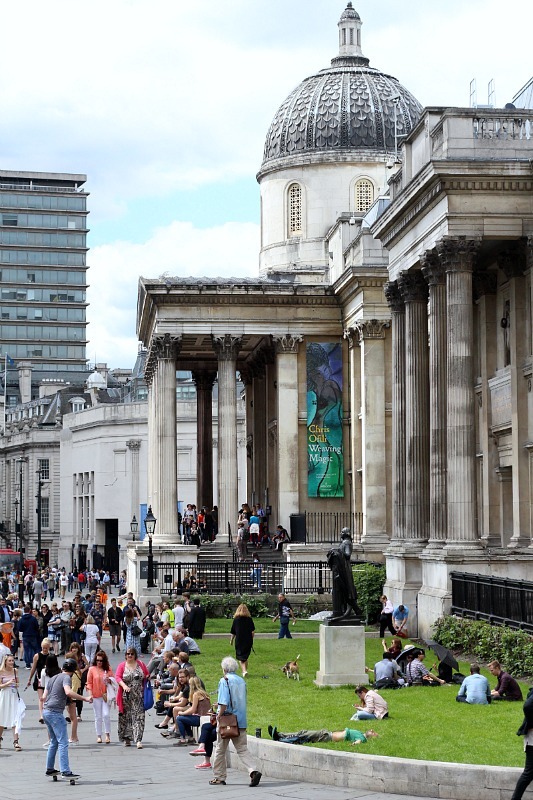 Here is the National Gallery. This predominate building is an art museum in Trafalgar Square in the City of Westminster, in Central London. It was founded in 1824 and houses a collection of over 2,300 paintings dating from the mid-13th century to 1900. Inside, Abbey is giving her dad an art history lesson. 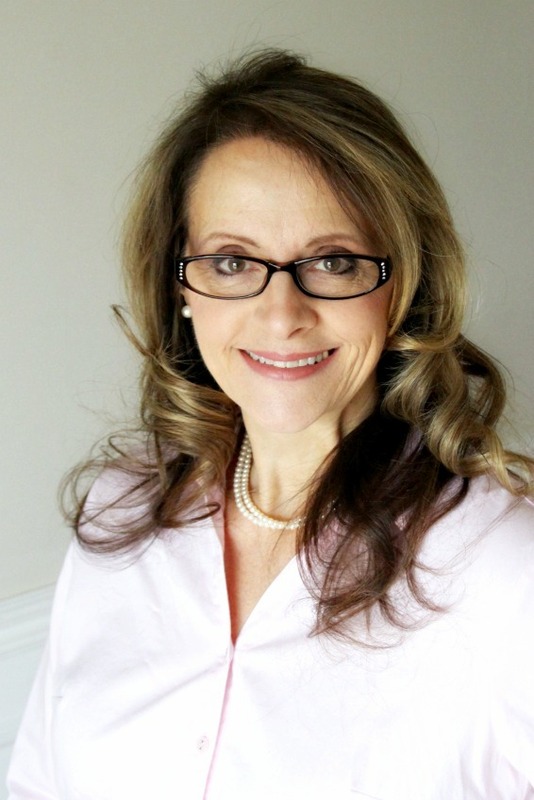 It is especially interesting to have her share her knowledge of the artists and their subjects. 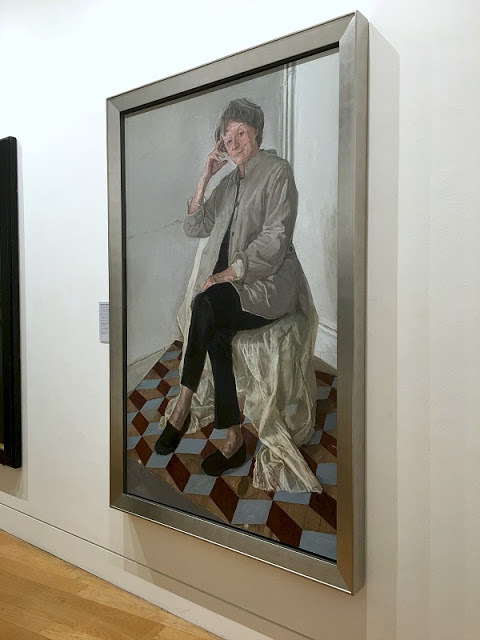 Just around the corner from the National Gallery is the National Portrait Gallery. Those who are fans of British programming will enjoy this portrait of Dame Maggie Smith. On display in Room 32, the artist is James Lloyd and it is a 2012 oil on canvas, 2012; size 74 7/8 in. x 47 3/8 in. 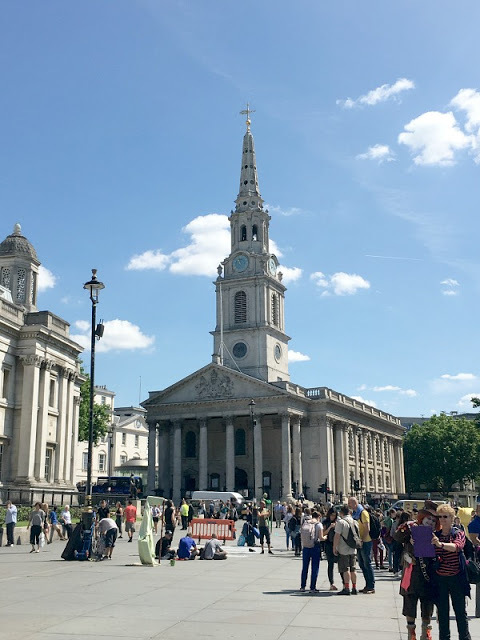 St Martin-in-the-Fields is an English Anglican church and sits at the north-east corner of Trafalgar Square. There has been a church on this site since the medieval period. 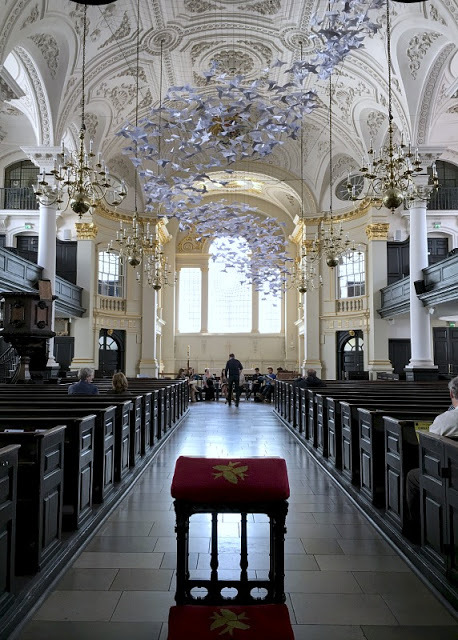 This is the amazing view inside St Martin in the Fields church. And, below the church, in the crypt is a most unusual cafe. 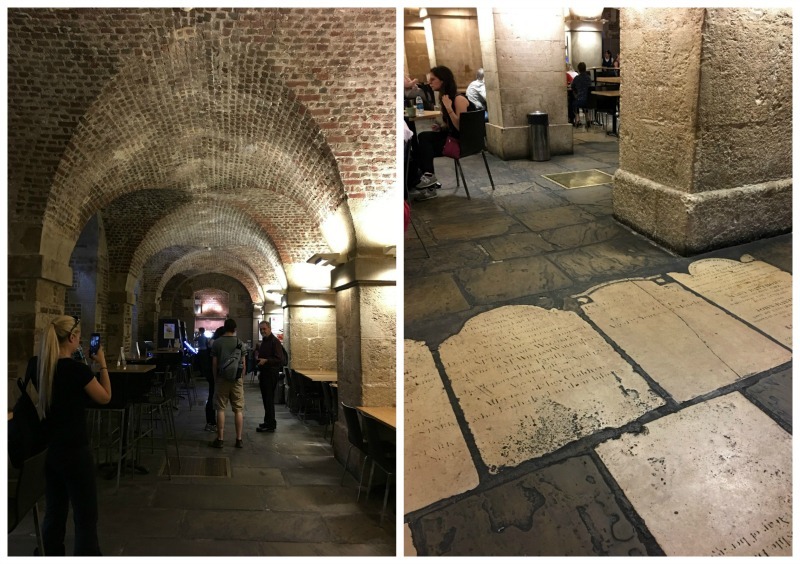 The Cafe in the Crypt is warm and welcoming with beautiful 18th century architecture brick-vaulted ceilings, historic tombstones beneath your feet and delicious food. 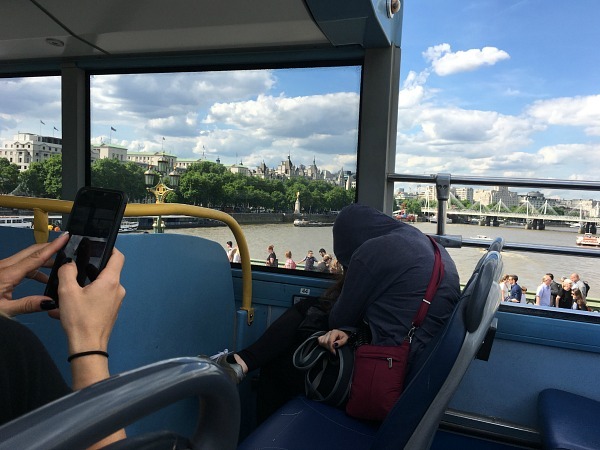 We planned a late-afternoon open-air bus tour through the streets and pass the major sites of London knowing our energy level would be running low by this time. 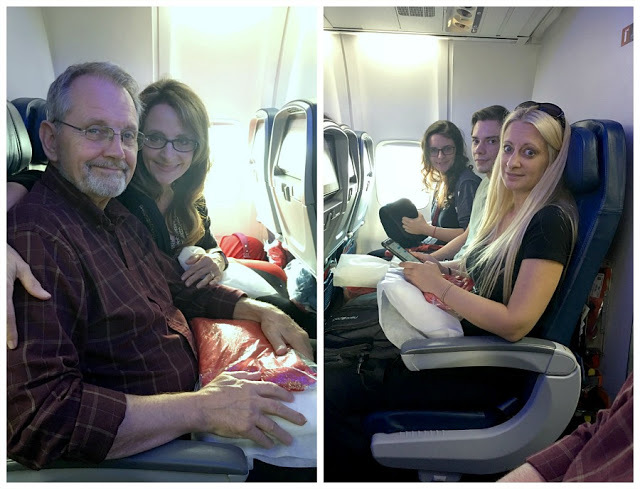 After almost 30 hours with just a few brief naps on the plane, some of us just couldn’t stay awake. Even in a place as exciting as London.I will be sharing our experience concerning the London Bridge attack in an upcoming post. I'm catching up with your trip after being away for several days without internet access. 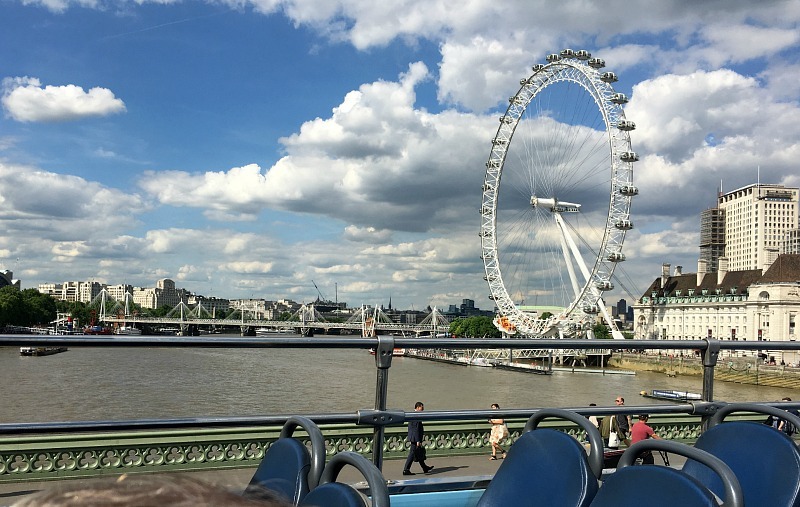 Your photos are wonderful – I almost feel as I was there with you! 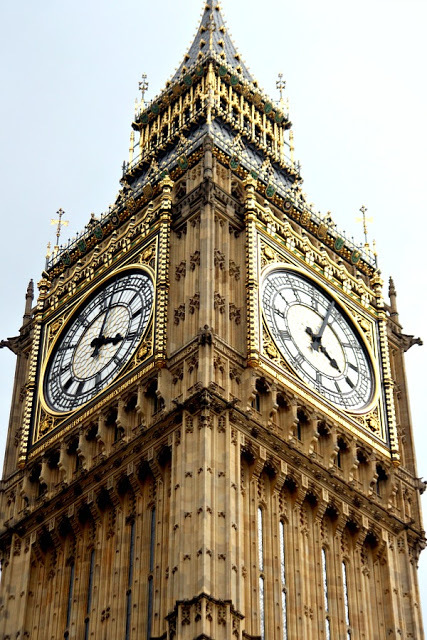 I'd love to travel to London someday but until then, this is a real treat! Looks like a fabulous vacation for all of you. Lots to see and do. Glad you are back home safe and sound.